The Tech men’s tennis team’s struggles continued as their losing streak was extended to seven matches after losses to the University of North Carolina and Duke. The Jackets (7-13, 1-9 ACC) were dominated in their final road trip of the season as both North Carolina teams shut out Tech 7-0. Tech could not win a single set against the No. 8 Tar Heels (22-3, 9-1 ACC). UNC took the doubles point by winning both matches. In the No. 1 doubles spot, Tech’s No. 43 ranked doubles team of junior Eduardo Segura and freshman Carlos Benito were edged out by the No. 27 ranked pair of Brayden Schnur and Brett Clark 8-3. The Tar Heels stifled any hope of an upset by Tech with their performance in the singles matches. Segura, Benito, freshman Cole Fiegel and junior Colin Edwards won few games in their straight set losses. Sophomore Nathan Rakitt put up a fight against No. 26 Ronnie Schneider in the top singles spot, dropping a competitive match 6-4, 7-5 that sealed UNC’s win. The Jackets put up a fight against the No. 13 Blue Devils (16-5, 8-1 ACC), but had little to show for it. After dropping the doubles point, the singles matches showed some promise. Segura and Benito were both dispatched rather quickly in the two and three spots, losing 2-6, 0-6 and 2-6, 2-6 respectively. Rakitt, playing the top singles position, made a push in the second set of a 3-6, 6-7 (4-7) loss to No. 42 ranked Jason Tahir. Fiegel, in the number four position, came within a few points of winning his match against No. 88 ranked Bruno Semenzato. He won the first set 6-3 and went to a second set tiebreak, but was unable to pull it off losing 6-3, 7-6 (7-3), 1-0 (10-2). Edwards made a similar push as well, winning the first set before losing the match 6-4, 3-6, 3-6 to complete Duke’s sweep and ending Tech’s forgettable weekend. Tech was already at a disadvantage before the start of either match as they only had five available players on their roster. As a result, they were forced to forfeit the No. 6 singles match and the No. 3 doubles match. This added to the disappointment of Tech’s season, which began with a solid 6-1 start. Since then, however, the men’s team has lost 12 of 13, with a lone win against an ACC opponent in Boston College. The past three matches have been especially difficult for Tech, with each one of them finishing without Tech winning a single point. The three highly ranked opponents, which includes No. 4 University of Virginia, managed to combine to drop just two sets in their individual matches against the Jackets. However, Tech has a chance to end its regular season schedule on a high note when it faces the No. 20 Clemson Tigers on April 18 at home. The Tigers have had struggles of their own as of late, having dropped four of their last five matches, including one sided losses to both the Tar Heels and the Duke Blue Devils. 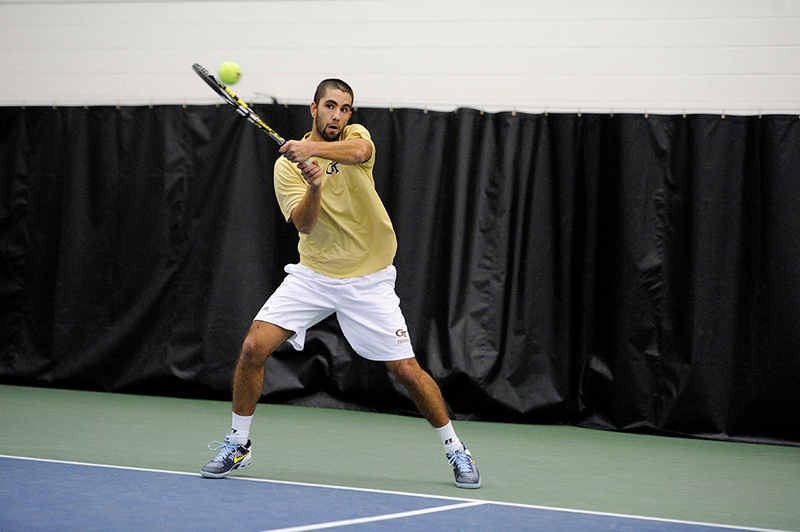 The last match of the Jackets’ season will start at 6 p.m. at Ken Byers Tennis Complex.